Sales contests have been run since the beginning of time (…or sales organizations) for one reason: to drive better sales performance. Simply put, oftentimes your reps will do more with sales contests than without — as long as you know how to keep your strategy fresh, that is. Imagine for a second that you’re running the same contest month in and month out. It could be around any metric — bookings, calls, meetings, whatever. At the end of the day, the contest is supposed to be there as an added incentive. However, if you’re running that same contest repeatedly it becomes an expectation. It becomes another part of each sales rep’s job. There’s an inherent problem in that, and it’s worth exploring in more detail. Fresh sales contests = successful sales contests. Salespeople are ultimately judged on the dollars they generate for the company, and most sales reps I know have a pretty good sense of where they stand to quota. They also have a pretty good grasp on which of their peers are the top, middle and bottom performers, since that’s talked about in sales meetings and around the office. If you’re running a sales contest around bookings over and over, you’re not offering your reps any new insight. It stands to reason that they’ll fall right back into their historical performance category. Here’s another scenario: If your “same ol’ ” contest motivates another metric, such as calls or meetings, unless you’re offering up some serious prizes every month (think cars, hot tubs, vacations), eventually the reps are going to ignore the competition and fall back to what they’re judged (and compensated) on: revenue. Then you’re stuck giving a prize to the guy who made the most calls, but couldn’t close a door. Who really wins there? Neither of these examples is meant to discourage you from consistently running contests. After all, they can be an effective way to optimize sales performance. You just need to build them in a smart way. 2. Look to the metrics. What area of your business could benefit from an immediate spike in sales activity? Need more pipeline? A lot of deals stuck at a particular stage? Nobody’s on the phones? Spin up a quick contest to drive targeted activity. Focusing on these tips, and keeping sales contests fresh in general, will keep your reps engaged and consistently striving to perform at higher levels. 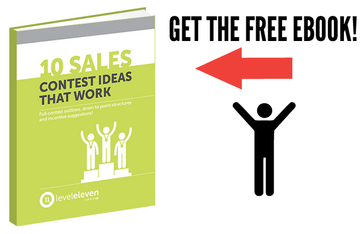 It’ll keep your sales contests producing sales results. Don't run the same old sales contests and expect sales motivation to thrive. Use these tips to keep things fresh.